Clickstream data is not widely known about. In short it’s the analysis of users clicking on websites. We’ve started exploring this and the clickstream we’re using is based on users clicking on particular search results. In short, if you do a search on Trip and click on documents number 2, 4 and 9 you’re effectively telling us that, for your intention, they’re connected. In isolation it’s arguably meaningless, but over thousands of searches you start to see structure. I’ve blogged about this previously (here, here and here) but now we’ve got more results. 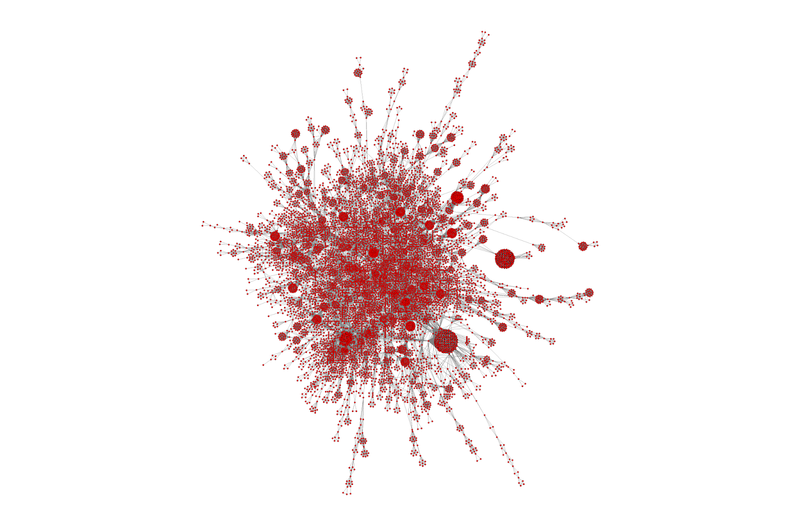 Below is the largest continuous graph/map of connected documents – over 10,000 long (click on image to expand). Recruiting for clinical trials: a role for Trip? I raise this as Trip has had two conversations in a week with organisations involved with trial recruitment and both are very interested in working with Trip and our network of users. Trip has around 100,000 registered health professionals, the vast majority will appreciate the need for clinical trials and therefore be sympathetic to the need to recruit patients. So, the idea seems to be that if we are made aware of a trial, of say heart failure, we alert health professionals who have indicated an interest in heart failure (either through their registration or their search history) and are based geographically close. Early days but it seems like a great idea. As well as hopefully improving patient recruitment it could also help Trip’s finances – win:win.